Bet on Harry Maguire to Join Manchester United at 4/7 with Coral. Bet on Manchester United to Win the Premier League at 15/2 with Paddy Power. Bet on Cardiff to be Relegated in 2018/2019 at 4/6 with Paddy Power. Manchester United are preparing an all-out attack on Leicester City to acquire the services of Harry Maguire. Sources close to Indykaila can reveal that United yesterday made an official approach to the Foxes regarding a move for the central defender. 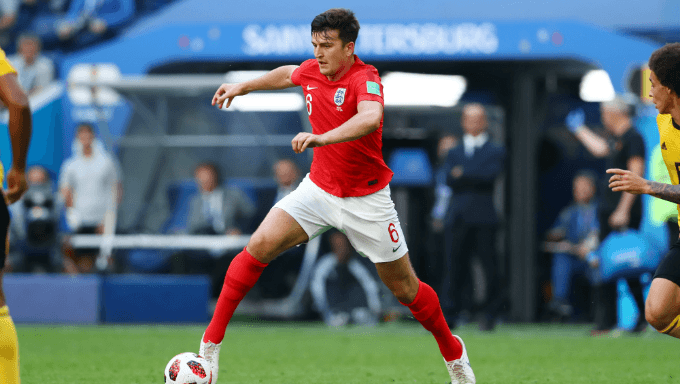 Jose Mourinho is on the lookout for a commanding ball-playing centre back and after an impressive run of form in the World Cup, it is Harry Maguire who has caught Mourinho's attention. The Red Devils are ready to pay a hefty fee of around £65 million for Maguire to come on board before the window shuts. Maguire played every knockout game for England in the World Cup and also played every minute for Leicester City in the Premier League last season. He was inarguably their most impactful player and made his name in the league as a no-nonsense, solid as a rock defender. But Leicester City are currently firm in their stance of not letting Maguire go in this transfer window. The former Premier League champions have already sold Riyad Mahrez to Manchester City and do not want to sell another one of their key players. Instead, Leicester are preparing to offer Maguire a brand new deal to keep him happy at the King Power Stadium. The Foxes are ready to offer Maguire a deal worth upto £80,000 per week if he decides to stay put under Claude Puel's management. Maguire still has four years left on his current Leicester deal. But Indykaila sources can exclusively report that Harry Maguire is tempted by an offer to join one of the biggest clubs in the world and is keen on joining Manchester United in the next fortnight. The 25 year old is currently on a holiday and is expected to report back to duty on August 4. Maguire believes that this is the right time to take the next big step in his career. After a successful World Cup showing, the centre back now wants to regularly test himself on the highest of levels and wants Champions League football under his belt. Manchester United know of Maguire's intentions to join them. But Leicester are known to be tough negotiators. The Foxes held Manchester City off for over six months and only let Riyad Mahrez go for a club record fee of £60 million. A similar approach is expected to be deployed in Maguire's case, which is being closely watched by the Transfer Hound. We can reveal that Leicester City will demand at least £80 million to let Harry Maguire join Manchester United. The Foxes are not in need of financial support at the moment and are ready to wait for Maguire's price to soar. The Leicester owners have decided that Maguire will leave the Midlands side only for a world-record fee for a defender, eclipsing the £75 million fee that Liverpool paid for Virgil Van Dijk. Manchester United have had a below par transfer window and may get desperate in the last 15 days of the market to land a big name. Leicester City know this and are hence holding out for a gigantic fee for their prized asset. Jose Mourinho needs a commanding central defender at his disposal and is ready to pay what's needed. This summer has seen Manchester United fail to land their top targets in the form of Gareth Bale, Ivan Perisic and Willian. Jose Mourinho and Ed Woodward would not like another failure on their watch and might prepare an onslaught to sign Harry Maguire. With the player ready to shift loyalties, one can expect a world-record move to go ahead in the next week or so. But Indykaila sources have also reported that Manchester United will have to sell one of their defenders if they are to get Harry Maguire. This means that one of Chris Smalling, Phil Jones, Victor Lindelof or Marcos Rojo will have to be sacrificed to make way for the Leicester City player of the year - Harry Maguire. Mourinho and his management staff believe that Maguire can be the perfect fit at the club alongside Eric Bailly. Playing as the left sided centre back, Maguire can expertly play out from the back, be a solid presence in aerial duels and be the biggest threat of the team during set pieces. Maguire was England's biggest threat during set pieces at the World Cup and it is this ability that may have lured Jose Mourinho towards him. United lacked a ball playing defender in their ranks and Maguire can be the perfect addition - defensively and offensively - for the Red Devils in a make or break season for 'the Special One'.